We served soup to about 120 people at the Community Soup Night. What a wonderful experience! There were so many friends and neighbors from the valley. Certainly more exhausting then quilting to cook for this many people and then serve and clean up but we did it and then went home tired but satisfied. What could be cozier on a Montana winter’s night than thoughts of delicious hot, steaming soup and a quilt composed of hearts? The quilters are taking their culinary skills into the Tobacco Valley Senior Center this Tuesday for the weekly Community Soup Night. We will be serving a baked potato soup and a beef tortilla soup along with salad, bread and dessert. Hope you stop on by. The fall has gone quickly. We are in a rush to get the current quilt rolled in small enough on the frame that there will be room for the holiday bazaar. The Historical Village bazaar items are my favorites – handmade baby quilts and crocheted mittens and hats, embroidered pillow cases and towels…just holding these items in your hand gives you a sense of the care and good feelings that went into making them. We also recently unveiled our raffle quilt for this year. It’s a floral beauty! I remember when we quilted it last spring. 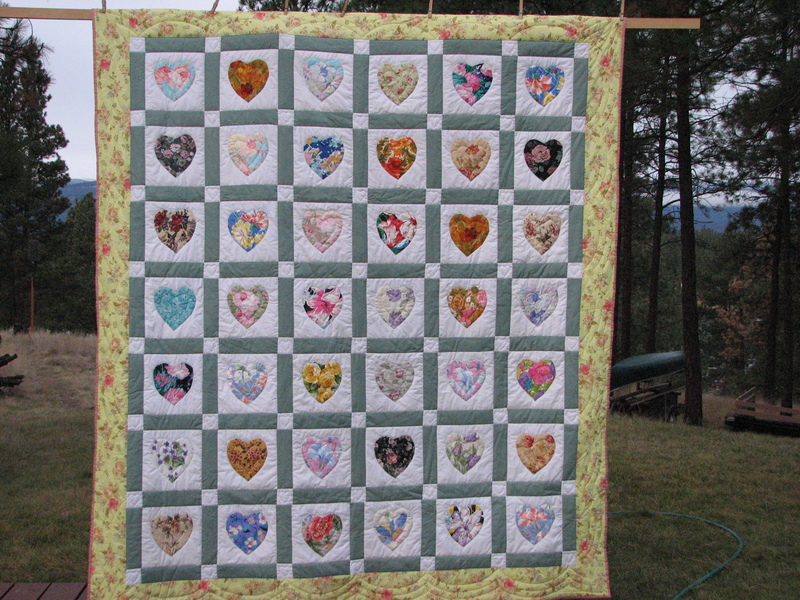 I wish you could see the back – always the best kept secret of a quilt – to see the many hearts stitched in. The raffle quilt will be on display at the bazaar. That happens on December 1 from 9:00 – 4:00. Maybe you can come to that as well! I came to quilting late this week and obviously had missed a lot. 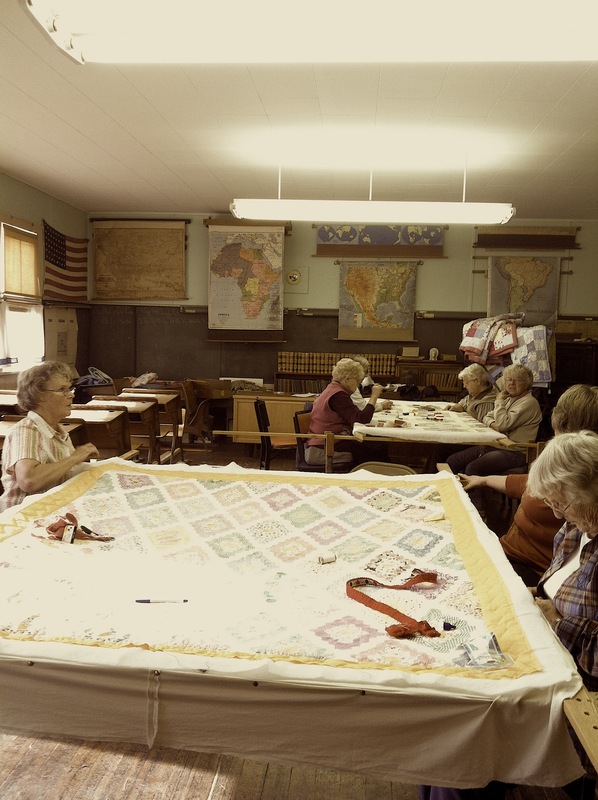 The women were busy working on two quilts. The Kings Highway is nearly finished. I don’t know the name of the pattern for the new one we are working on which has such lovely old fabrics. As usual when I sit down to begin stitching, I notice how tiny and regular the stitches are that have already been done. I hesitate to even pick up my needle. Hard for me to get both tiny and regular or even sometimes either. But I practiced patience and after doing a bit, if it really looked disagreeable, I took my stitches out and started again. Now we are starting to plan for the Holiday Bazaar which happens on the first weekend of December which this year is December 1 and that means it is coming right up. We will sell all sorts of handmade items – baby quilts, full-size quilts, embroidered pillowcases, hats, potholders. It amazes me how much some of these women can produce in a week. Perhaps one of the lessons from this blog is that I am not a professional writer (can’t write on a regular basis), I am not a professional quilter (hopefully my irregular stitches are minimized by the hundreds of other beautiful stitches done by the other women) and I am not a production sewer or knitter or anything else. Good thing I have a day job. The bazaar weekend is one of my favorites in the valley. There are so many wonderful bazaars at various churches, Trego Hall, the Creative Arts Center and of course the Historical Village. During our quilting, Lynda wrote our names down for which shift we would each work. I like to come in the morning to see the day start and then leave by noon to visit the other bazaars. It really is an amazing valley. When I think of the number of people who live here and what they accomplish – both personally and for the community, it gives me hope.